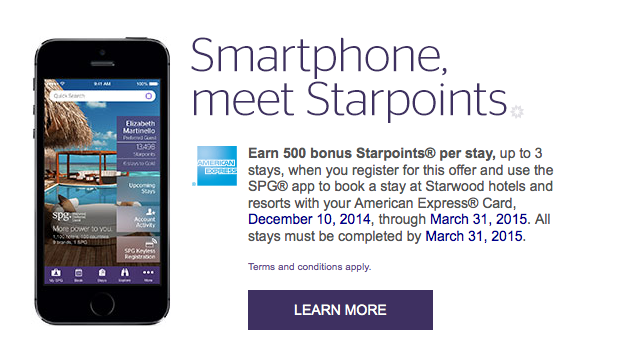 Starwood Preferred Guest has a new bonus out for bookings made via the SPG App and paid for with an American Express card. You must register first then you can earn the bonus of 500 Starpoints for up to three stays booked via the app (1,500 bonus points total). The offer is good for stays until March 31, 15. Once again this is the type of offer that has made us stress for nearly 14 years that you should carry at least one brand of each major credit card (Visa, MasterCard, American Express) so that you can take advantage of these offers that require the use of one specific card.